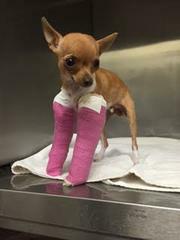 On the morning of Tuesday, October 27, 2015 a Santa Rosa Junior College (SRJC) employee found a Chihuahua puppy injured inside a large dumpster located at the SRJC Bech Parking Lot, near the greenhouse in Lark Hall. The employee took the puppy to a local animal hospital where it was given medical attention for two broken legs. The staff at the animal hospital notified Sonoma County Animal Services who took custody of the puppy and is conducting an investigation. The SRJC District Police Department was notified the following day and are assisting with the investigation. There were no identification tags nor an electronic chip on the Chihuahua. At this time the person who is responsible for puppy’s injuries and throwing it in the dumpster is unknown. The SRJC District Police Department is assisting Sonoma County Animal Services in their ongoing investigation. We are asking anyone who was in the area around the time of the crime who may have witnessed anything suspicious or who has any information to come forward by contacting Sonoma County Animal Services Officer Justin Ofster at (707)565-7100. The District Police are also asking everyone to be aware of their surroundings while on campus and to immediately report any suspicious persons or activities to (707) 527-1000. We all must work together in keeping our pets and our community safe.